It seems that Arlene Foster, the beleaguered leader of the Democratic Unionist Party (DUP), has adopted the electoral playbook of Donald Trump, decrying the news media as the enemies of her community, while indulging in some nakedly atavistic rhetoric to whip up votes for the forthcoming Stormont assembly election in the north-east of Ireland. In recent days she’s moved on from dismissing Irish-speaking men, women and children as voracious crocodiles who need to be starved into submission (or extinction) to holding question-free press conferences, à la the Manhattan millionaire during his presidential run (of course, some might wish that Kaiser Drumpf had stuck with that formula). Yesterday’s DUP manifesto launch to a gaggle of bemused journalists was accompanied by a bizarre statement claiming that Arlene Foster was suffering a heavy dose of the “man flu” and therefore could not answer questions. Apparently this selective mutism also extended to her colleagues, including the otherwise voluble Nigel Dodds. Of course, the MLA for Fermanagh and South Tyrone is a woman, albeit in the mold of a Thatcherite wannabe roaming the political streets looking for a scrap with nationalists, republicans, gays, racial, ethnic or religious minorities, pro-choice feminists, liberals or whoever else fails to match her particular vision of British homogeneity. Just 4 the record. I didn't give Arlene the flu. Indeed, watching the DUP’s recent media performances, egged on by the even more extreme Traditional Unionist Voice (TUV), it is clear that the Dupes are hoping to fool the pro-union electorate into believing that the Six County parastate is on the brink of some sort of existential crisis. Given that the United Kingdom’s legacy colony is bedeviled by scandals from within and threats from without, as the anti-European Union referendum victory in the UK continues to have unexpected consequences for both island nations, they might not be entirely wrong. ARLENE Foster name-checked Sinn Féin a staggering 32 times in a speech yesterday at the launch of the DUP’s manifesto. Yesterday Mrs Foster made 12 specific references to the Sinn Féin president. The DUP leader was responsible for overseeing the botched green energy scheme as enterprise minister between 2012-2015 before moving to the Department of Finance and Personnel. The generous subsidies paid to around 2,000 farmers and businesses are forecast to cost Stormont up to £490m over the next 20 years. Notably, neither Mrs Foster nor her deputy Nigel Dodds would answer questions from the media at the manifesto launch in east Belfast yesterday. 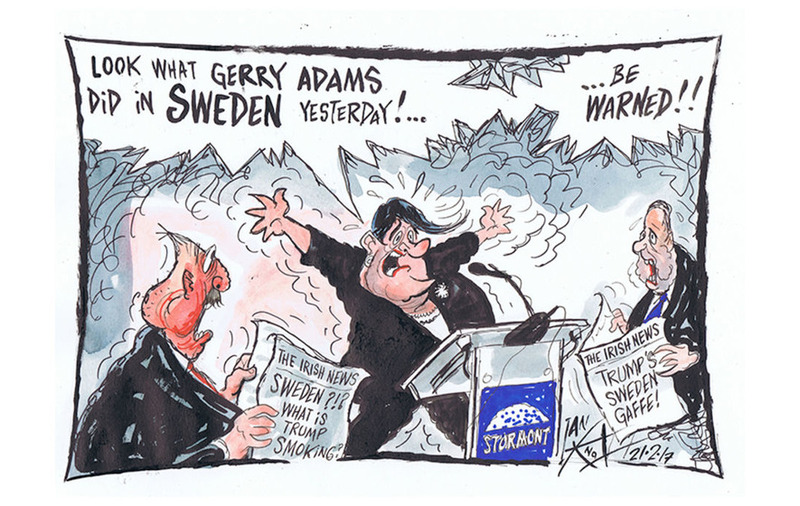 The Irish News gets it right! The hibernophobic campaign of the DUP may be drawing the derision of the national press in Ireland and Britain, but the unionist apologists of our very own Independent News & Media are more than happy to ride to Foster’s rescue. Their efforts at soft-soaping DUP bigotry has centred on some amateurish propaganda attacks against Sinn Féin, including, shock-horror, a report that Michelle O’Neill, the regional leader of the party, favours the reunification of Ireland. Of course, sometimes the myopic partisanship of the activist-journalists in the Irish and Sunday Independent newspapers can lead them into choppy waters. Legally speaking. ‘Arlene Foster … decrying the news media as the enemies of her community’ ‘but the unionist apologists of our very own Independent News & Media are more than happy to ride to Foster’s rescue’. Those statements don’t quite jibe without further explanation. Foster has attacked the local press for misrepresenting her and her party’s actions during the RHI scandal , etc. claiming a wider anti-unionist agenda is fuelling it all (by which she means critical of the DUP). The IN&M stable of newspapers in recent days have gone out of their way to attack SF in the run-up to the regional vote for Stormont, including libellous reporting. They may disdain the troglodyte DUP but as the saying goes, my enemy’s enemy is my friend. Hope that explains it a little better? In the past few years in the UK, what was kept hidden has been revealed. The Establishment, Unionism, Sectarianism, Racism, Neoliberalism. As each has been brought out by events into the light, their power has diminished and their influence has waned. This is still ongoing. In north east Ireland and elsewhere, 1 British Imperial and Colonial power is coming to an end, due in no small part, to its own corruption and incompetence. The DUP and others are but a pile of sand trying to stop the incoming tide of a new era in which freedom and justice are more evenly spread, as a healthier, truer democracy is established. And yet, a new and even darker force has appeared, the rise of the Right. Already making headway in England, it is on course to change the political and social culture of England. All Ireland should beware. Change is taking place on mainland UK which may well have enormous consequences for the whole of Ireland, including the likely event of Independence for Scotland. The days of The Establishment, with its corrupt predictability and gerrymandered stability, will soon be over. But not just yet. Good luck to all with the ‘not just yet’ time, for it won’t be easy. Ah the right are alright, it’s the left that can be a bit sinister.